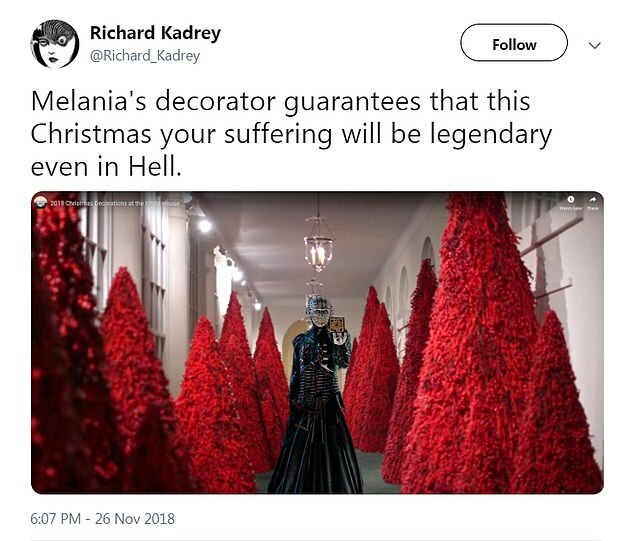 Melania Trump unveiled the White House Christmas decorations this week, and for the second year in a row, both the media and social media users mercilessly mocking the first lady’s ‘scary’ decor — this time claiming the ‘blood red’ trees are reminiscent of The Handmaid’s Tale and The Shining. Red plays heavily in the decor, which includes 14,000 crimson ornaments on 29 trees in the Grand Foyer and Cross Hall as well as 40 cranberry-covered trees that line the East Colonnade. ‘The choice of red is an extension of the pales, or stripes, found in the presidential seal designed by our Founding Fathers. It’s a symbol of valor and bravery,’ the White House explained. However, many people saw the red trees in a different light. 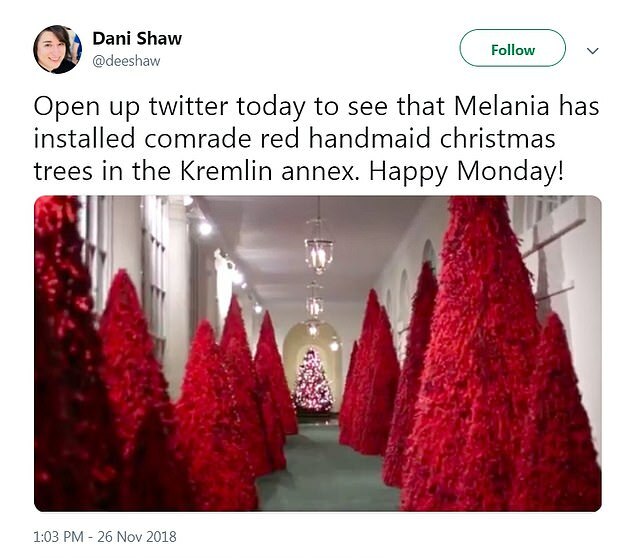 They compared them to the red handmaids dresses worn by the women forced into sexual slavery in The Handmaid’s Tale and the blood that flows down the hallway in the 1980 horror film The Shining. 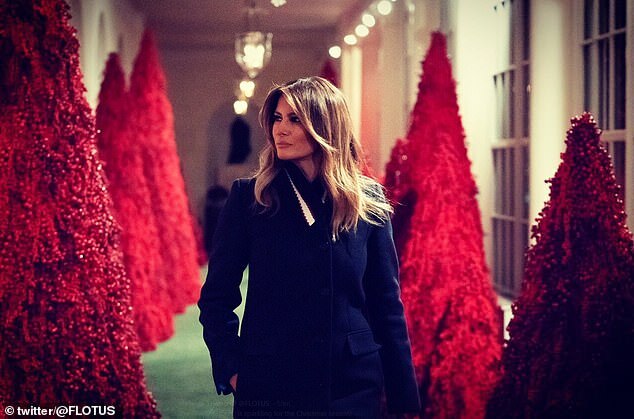 ‘So Melania decorated the White House for Christmas – with blood red trees right out of The Shining: Holiday Version. 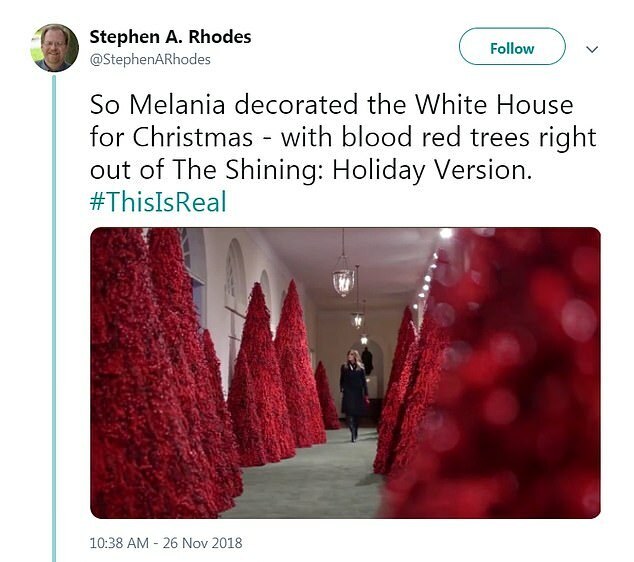 #ThisIsReal,’ Stephen A. Rhodes tweeted. 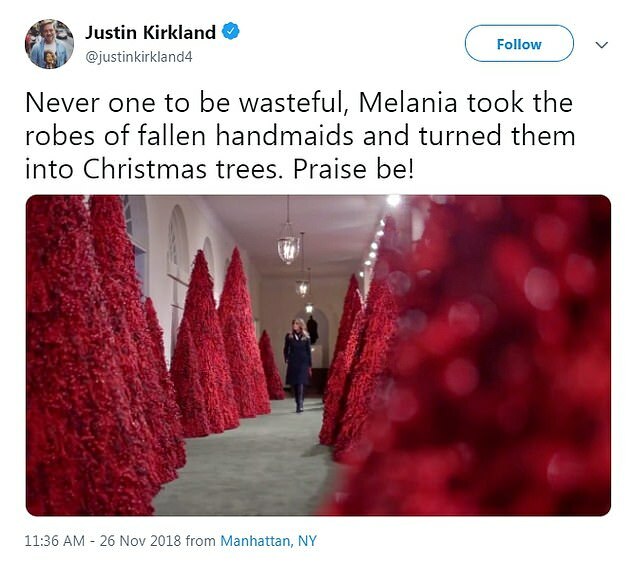 ‘Never one to be wasteful, Melania took the robes of fallen handmaids and turned them into Christmas trees. Praise be!’ Justin Kirkland commented. 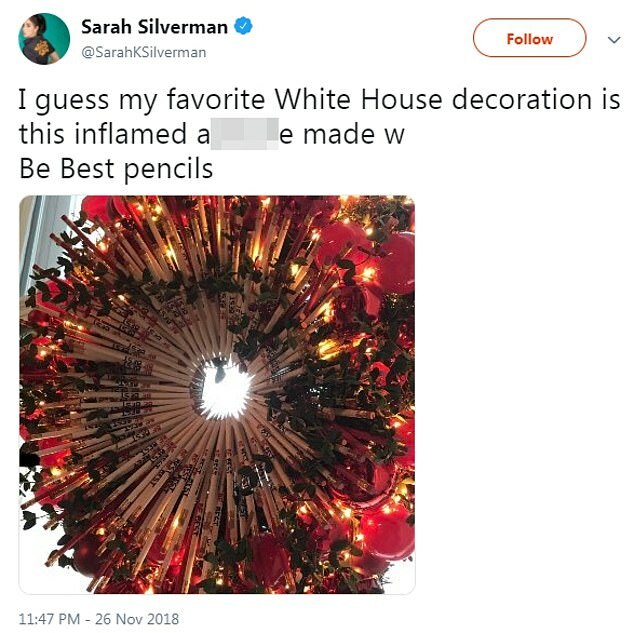 Meanwhile, several media outlets dedicated entire articles to tearing apart the decorations. 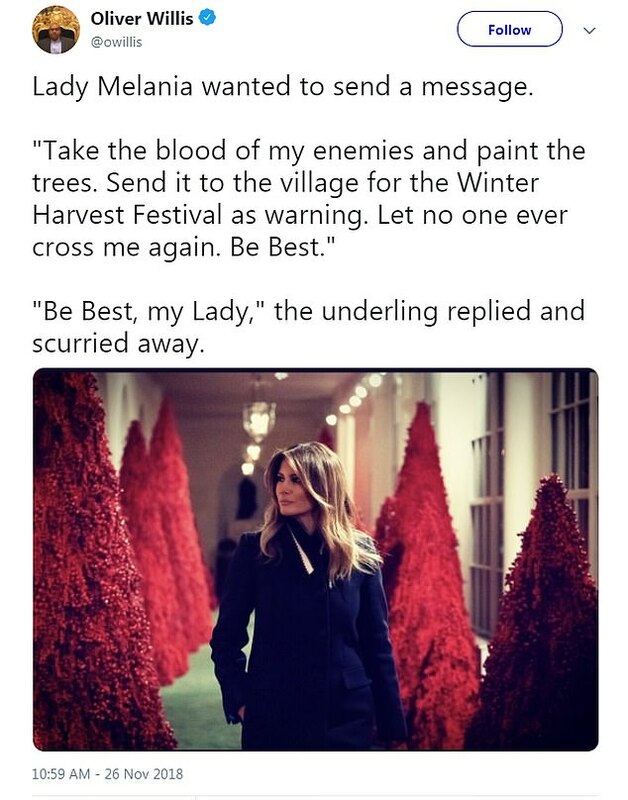 ‘Another year in the Trump White House, another opportunity to add a touch of holiday magic to the banality of evil!’ reads one line. The Cut’s article, titled ‘Melania Trump Ushers in Another Deeply Haunted Holiday Season,’ takes a look at this year’s ‘American Treasures’ theme. 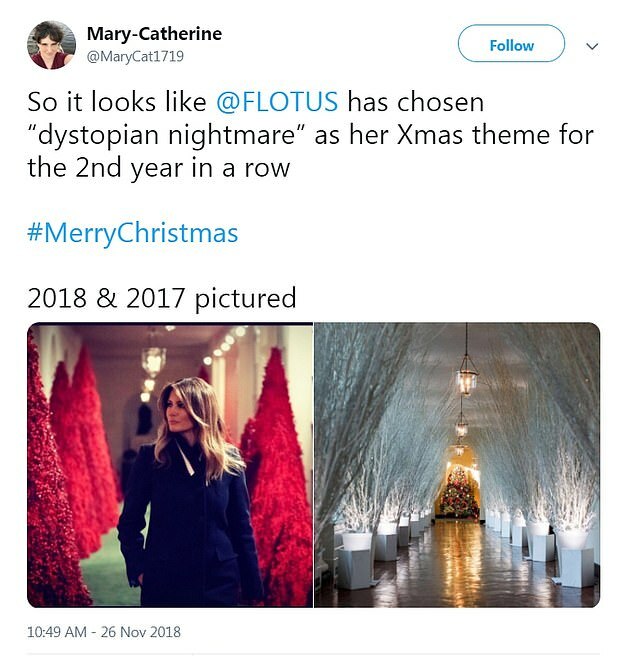 ‘This year, Melania posted a video of herself admiring “America’s Treasures” which are, apparently, ominous-looking red Christmas trees, a soccer ball ornament, and a wreath made out of Be Best pencils,’ the article states. 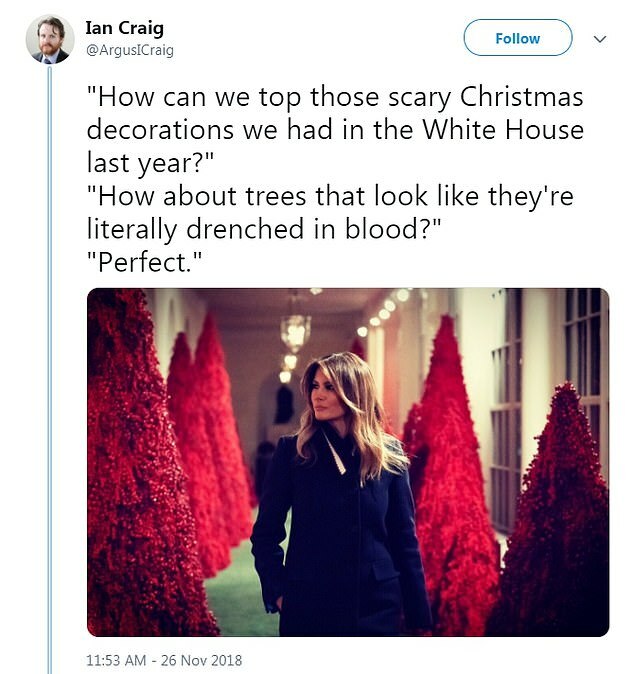 Unsurprisingly, the decor inspired plenty of memes designed to highlight the creepiness of the red trees. 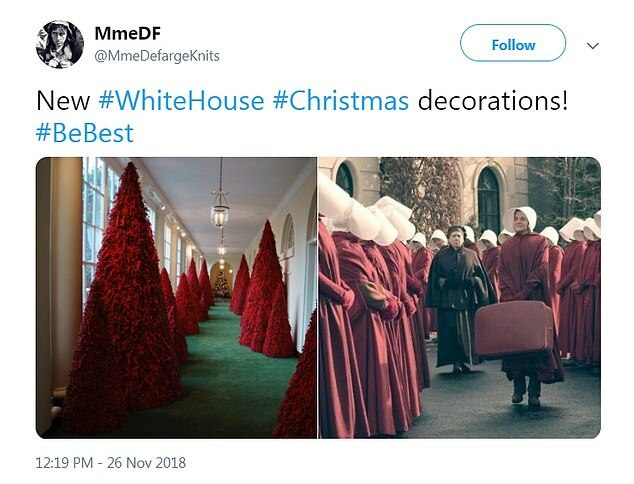 Someone else couldn’t resist sharing side-by-side photos of the red trees and a group of handmaids lined up in their red cloaks in a scene from the Hulu series. 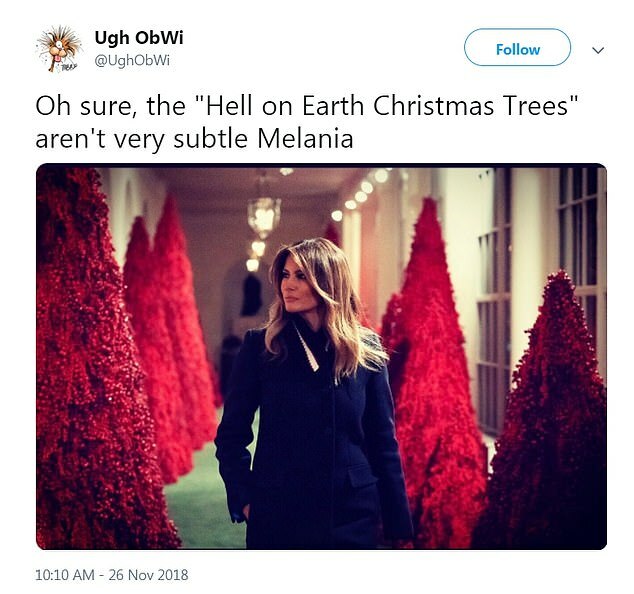 A few people questioned Melania’s ornate taste in general. 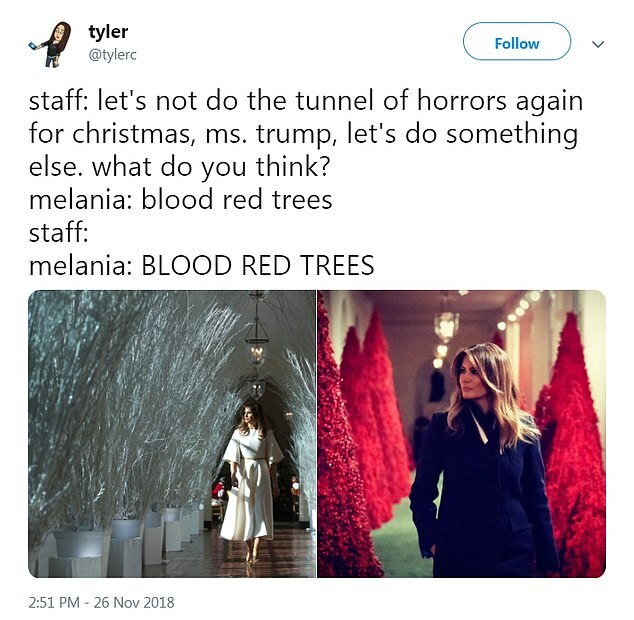 Melania’s White House holiday decorations faced similar scrutiny last year, as many felt the eerie, twig-lined hallway she designed was downright haunting and better fit for a scene in a horror film. 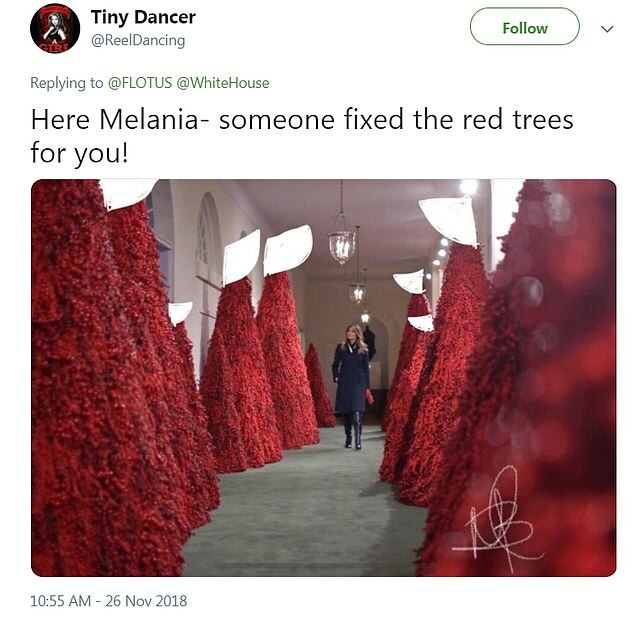 Twitter user Amber Sparks shared side-by-side photos of this year’s red trees and last year’s white branches to point out the similarities. 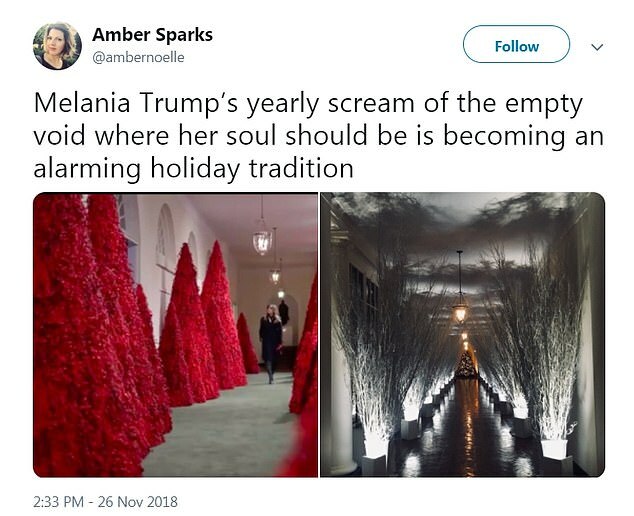 ‘Melania Trump’s yearly scream of the empty void where her soul should be is becoming an alarming holiday tradition,’ she wrote. 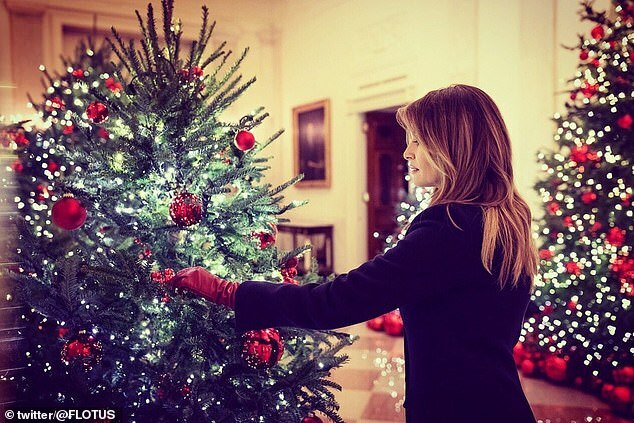 In addition to the jokes about the decor, people also slammed Melania for unveiling the decorations on Twitter on Monday, just one day after children were tear-gassed at the U.S.-Mexico border. Migrants who approached the U.S. border from Mexico were enveloped with tear gas as a few tried to breach the fence separating the two countries. While photos from the distressing scene caused outrage online, President Donald Trump took to Twitter on Monday morning threaten to close the border permanently. ‘Mexico should move the flag waving Migrants, many of whom are stone cold criminals, back to their countries. Do it by plane, do it by bus, do it anyway you want, but they are NOT coming into the U.S.A. We will close the Border permanently if need be. Congress, fund the WALL!’ he tweeted. 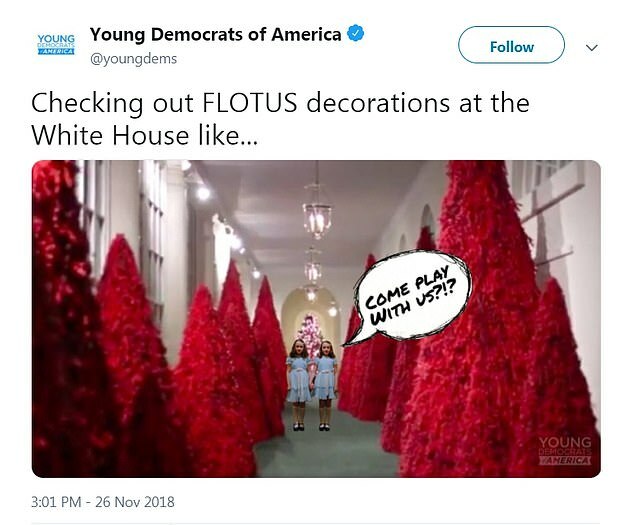 Just a few hours later, Melania posted a video and some photos of the administration’s holiday decor, which some thought was in poor taste. 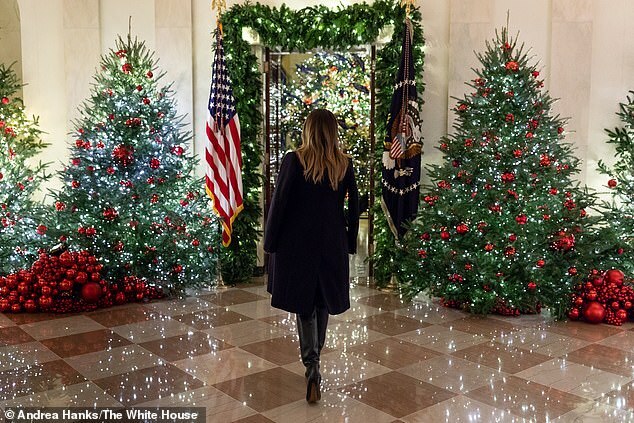 ‘Thanks for the holiday inspo, @FLOTUS! 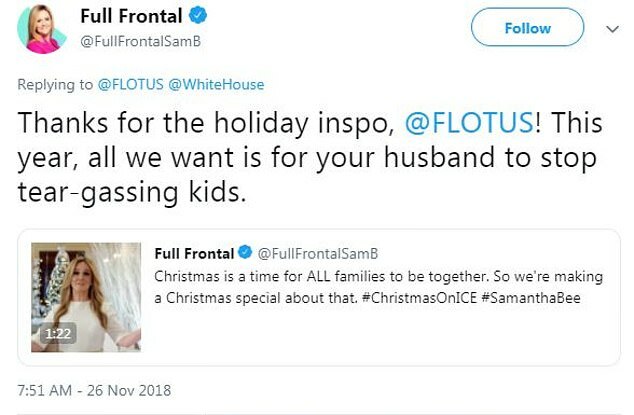 this year, all we want is for your husband to stop tear-gassing kids,’ tweeted Full Frontal, Samantha Bee’s late-night show. ‘What a great way to start the Holiday Season ….. tear gassing young children at the Southern border. #HeartlessAtTheHolidays,’ Alison L. Dunn responded. ‘Marie Antoinette anyone?’ someone else asked.